We have just completed and published our real estate infographic for the month of July, and not much changed when compared with July 2013. 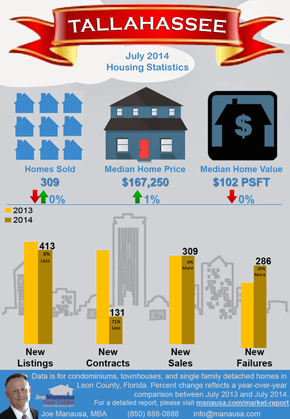 The reason that we produce a infographic each month is because a picture of the market is often times easier to digest than a mere written report, so take a look at the current picture of the Tallahassee real estate market. Well, if a picture is worth a thousand words, then here's a thousand for the Tallahassee real estate market. The same number of homes sold in July that sold last year in July, though some late posted sales are likely to come in to make this year slightly better than last. the median home value dropped about 1/3rd of a percent. The number of new listings entering the market declined by 8%. Fewer homes were listed this July and more homes departed the market as failures, so we know that the supply of homes for sale in Tallahassee has declined (even more so than it did last July). The number of sales, the median sales price and the median home value remained basically unchanged, so the biggest story from the picture is the continued decline of new contracts being reported by Realtors. This is a trend we began reporting back in May, and it really does not make much sense. We know that part of the declining contracts trend is due to the decline of short sales in Tallahassee (we often see multiple contracts on short sales which of course results in just one closing), but the number of contracts being recorded is far too few to justify the number of closings being recorded. How can we continue to report fewer than 150 contracts each month and yet continue to close on 300 homes? We will continue to study whether or not we are seeing a new trend in Realtor processes or if it is indeed a slowing of the buyer pool in Tallahassee. You can continue to check back or simply subscribe to the Tallahassee Real Estate Newsletter below to get weekly updates.